Welcome dear one! I want to be of service to you. Your life has profound purpose. Its destiny is written in the stars. But the page is not finished! With each moment you participate in the evolution of your destiny. So what will it be? Your soul is divine light, incarnated for a mission, a unique constellation of gifts. Yet too often debilitating emotions shroud our radiance. Even those who practice yoga or meditation can get overwhelmed. No one is immune from the suffering of self-doubt, regret, insecurity, fear. But light is more powerful, and Jyotish is the Science of Light. Jyotish offers a universal remedy for all: true knowledge. It opens the divine eye so you see the blueprint of your soul. You know your purpose, you meet your divine allies. Your awareness expands to manifest confidence, abundance, energy, exuberance, radiant light. Bring to me whatever brokenness, confusion, questions or doubts trouble you. I can help you heal challenges in relationship, career, family, health. You can realise a state of inner peace and outer freedom, which is both total and permanent. A Birth Chart Reading is the place to start. 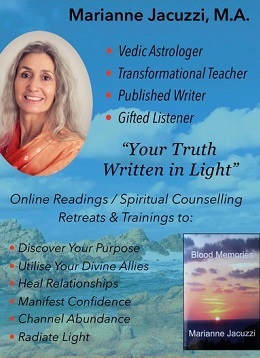 Specialised readings and Spiritual Counselling can follow. Also inspirational retreats and trainings. Sign up for my Newsletter to stay in touch. I look forward to meeting you, fellow seeker!